Provide comfort for the family of Charan Chutti with a meaningful gesture of sympathy. 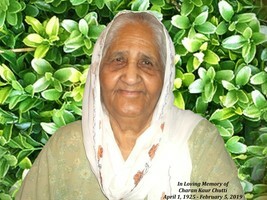 Raised by her grandmother Ram Kaur, Charan Kaur Chutti passed away peacefully February 5, 2019 at the age of 93, in Squamish BC, Surrounded by her family and friends. She lived a long happy life filled with love and joy. Charan Kaur is predeceased by her husband Lachman Singh Chutti; and is survived by her daughter and son-in-law, her three sons and three daughters-in-law, 14 grandchildren, and 14 great grandchildren. Please join us in celebrating her life February 16th at 11:00am at the Squamish Funeral Chapel. We encourage you to share your most beloved memories of Charan here, so that the family and other loved ones can always see it. You can upload cherished photographs, or share your favorite stories, and can even comment on those shared by others.